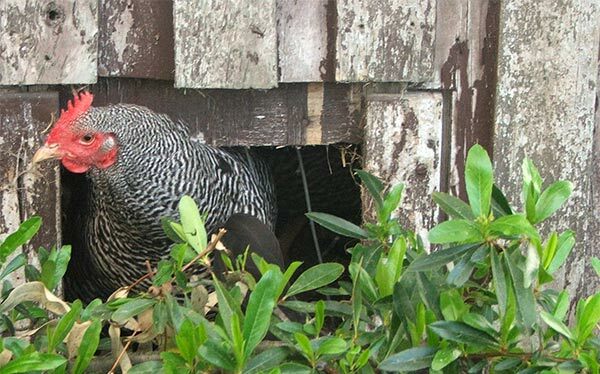 My first poultry experiences were with a gang of three itinerants - a rooster, a brown hen, and a white hen. They appeared from the next-door paddock one day, liked what they saw, and stayed. Like a totally indulgent human parent, I had no idea of chook-discipline. I let them run riot through my garden, and roost in the trees next to the house. Aargh! That noise - rooster crowing in the moonlight! Now my hen-house has been repaired, a proper run has been constructed, and I am the proud owner of some new, well disciplined chooks. And thanks to my friend Krystina, the chook version of TV's super-nanny, I am more than twice as wise. She explains it rather simply - chooks have two passions in life, to scratch and to peck. My job is to provide resources for both. Chooks also like to be secure at night. They do not get bored in chicken runs, though the odd afternoon spent scratching in the Hazelnut Orchard would be a treat. 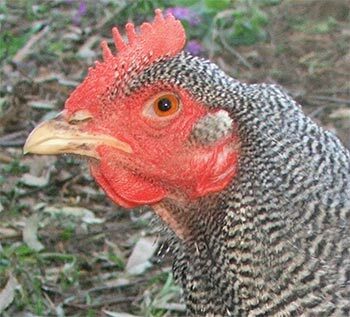 My new poultry pack consists of one silver barred birchen rooster, two large barred Plymouth Rock hens, and four smaller black bantams. It's a cosy fit on the hen-house perch at night, and already the Moosey kitchen is over-egged - omelets, crepes, eggy cakes, and eggy salads appearing at every meal. As instructed by my chook super-nanny I shut the chooks in their hen-house for the first six days (with food and water, of course). Then came the Saturday morning when the little chook-door was officially opened. I lurked by the netting with my camera, ready to capture the first glorious moments of freedom - what a sight! 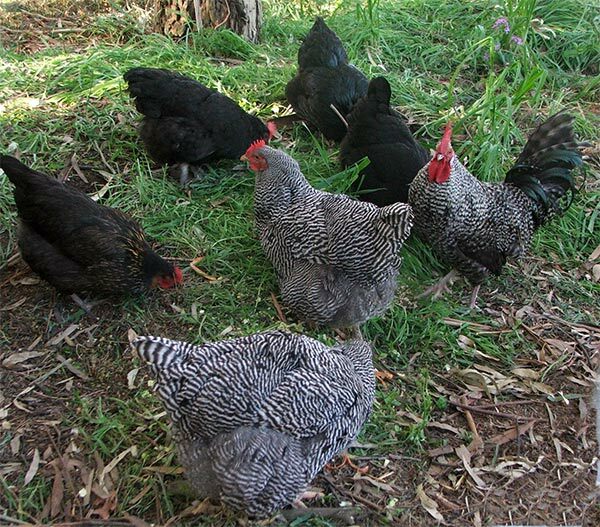 The air was filled with gurgles of chook-delight, as all the birds scratched and rolled in the dirt. Annie - Young black hen with gold lacing. Amelia - Young all-black hen, small comb. Donna - Young all-black hen, bigger comb. Daisy - Young black hen, silver neck feathers. Harriet - Barred Plymouth Rock, older bird, with hole punch (ouch) in foot. Hilda - Barred Plymouth Rock, older bird, pristine feet. Brewster - Silver barred birchen rooster, a young cockerel enjoying his first hen-experiences (far preferable to the pot or the freezer). Thanks very much to Krystina for providing such well-behaved birds, and for her strong words of advice. My chooks eat layer pellets, a bit of grain for an afternoon treat, and lots of kitchen left-overs like rice, cooked potato peelings, lettuce, cabbage, silver beet and other greens. Gourmet treats include over-ripe avocados and tomatoes and a ghastly concoction made with seaweed powder, oatmeal and plain yoghurt. Eek!